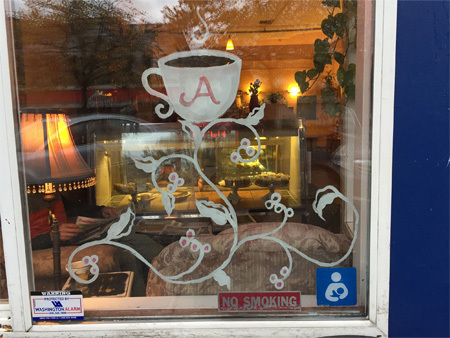 At Avellino Coffeehouse, located on Railroad Avenue, customers seek us out for our outstanding coffee and our signature baked goods such as our scrumptious muffins, our delectable scones, savory cinnamon rolls, our appetizing breakfast burrito and much more! Are you tired of feeling "different" because you want great taste and gluten free? Then come to Avellino Coffeehouse and treat yourself to a large selection of regular and gluten free American pastry items baked fresh daily with only local ingredients. Fresh GLUTEN FREE Baked Goods Every Day! - All of our gluten free baked goods are prepared fresh every day at our sister store, Avellino Gluten Free in Bellingham! They are delivered daily to Avellino Coffeehouse for your enjoyment! At Avellino Coffeehouse, our hallmarks are quality, variety, and consistency! Exceptional quality goes into both our baked goods as well as our coffee. If you want coffee like you've never had before - world class coffee with a bouquet that consumes your senses, a full coffee that exquisitely captures that perfect balance of body, acidity, and flavor, then Avellino Coffeehouse is your next stop! Our coffee is so famous because it is made with a "premier blend" - a triple origin bean from Indonesia, Guatemala, and Brazil. Our beans are roasted locally at Lotus Coffee Company so you can enjoy premium gourmet coffee right here in Bellingham! "Our reputation is so good because we pride ourselves on our product, and we provide great quality customer service while doing it. I think our customers keep coming back for those reasons and for our amazing atmosphere!" Depending on your mood and the weather, choose from our refreshingly tantalizing cool drinks or hot energizing espresso concoctions. Hot and thirsty? Try a ginger blast, or an espresso frappe, or perhaps an Avellino fantasia. Cold and tired? Rejuvenate with our homemade caramel latte, or how about a hand-grated chocolate mocha, or maybe a smooth, yet robust americano or straight up dopo. At Avellino, we create our caramel sauce in house and it's the key ingredient in our mochas and lattes! And when you order a mocha, choose from regular chocolate, white chocolate - both sugar free and regular, and Mexican chocolate that can be melted into your milk-or go for all three! 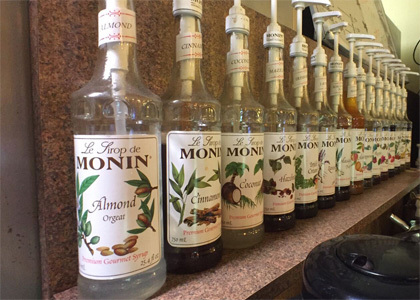 We also offer our customers premium quality Monin syrups that are considered the gold standard for hot beverage accented sweet flavoring. When it comes to atmosphere, Avellino Coffeehouse offers an "at-home" feeling accented with upbeat lively music and displays of local artwork, a laid-back environment, along with a welcoming and comfortable atmosphere. In addition to stimulating conversations, people come to our Bellingham coffeehouse to read, write and simply to relax. Because we are a business that serves the needs of our community, Avellino Coffeehouse supports local artists with our rotating gallery of artwork - on display throughout our Coffeehouse. Avellino is proud to exhibit a broad array of artwork that represents the best that Bellingham has to offer. What better pairing than coffee and art! We also provide a community bulletin section that lists cultural activities and entertainment acts in Bellingham. 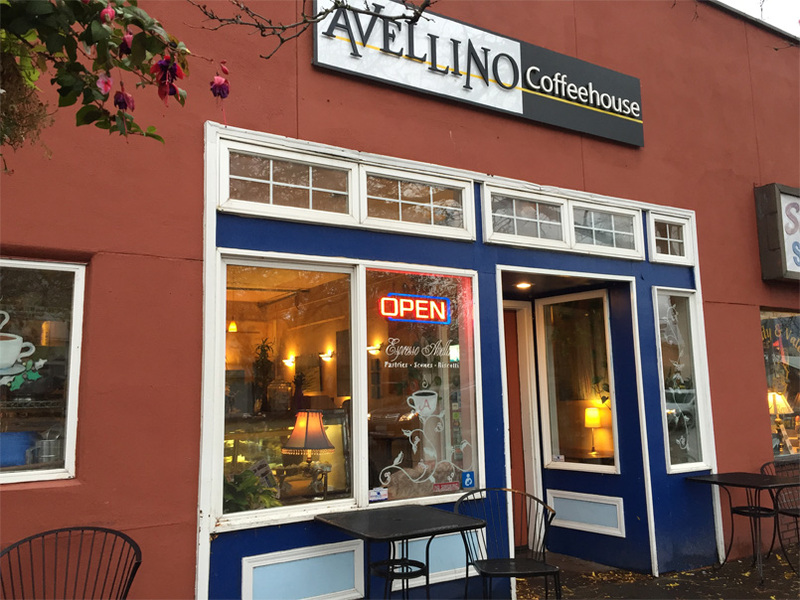 Avellino Coffeehouse has been a mainstay and community hub in downtown Bellingham for nearly two decades, in part, because we treat our customers like family. Talented and friendly baristas serve your orders with flair and a smile! So if you long for friendliness over snobbery, and you appreciate the value that comes with a fair price for an exceptional product, and you want to experience personable, outstanding customer service, then we invite you to make Avellino Coffeehouse your new home away from home!